Regento is comprised of resorbable, particulate beta-TCP granules and supplied in a sterile, single use kit. Regento granules are provided “ready-to-use”, however the granules may be combined with sterile physiological solution, autologous bone marrow aspirate or blood prior to implantation. Regento granules are resorbed and remodeled by the body as new bone formation occurs during the healing process. Regento is intended for use to fill bony voids or defects of the skeletal system (i.e. posterolateral spine, extremities and pelvis) that may be surgically created or osseous defects created from traumatic injury to the bone. 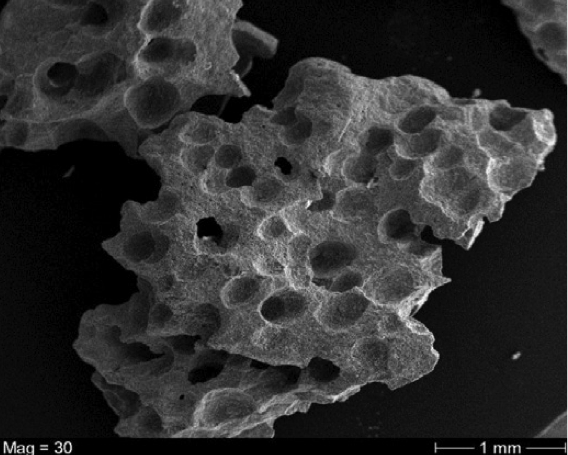 Interconnected macro and microporosity have been shown to positively influence the bioactivity and performance of bone grafting materials†. As pictured below, Regento particles are characterized by a network of microporous channels and surface “pitting”, which maximizes overall surface area, leading to enhanced protein deposition and cell attachment. The network of porosity further enables remodeling to incur from within, as well as outside, each granule. † Hing et al. Journal of Materials Science: Materials in Medicine (2005); Hannink et al. Injury (2011); Bignon et al. Journal of Materials Science: Materials in Medicine (2003).